Many times you would be in a situation where you have accidentally closed a application and regret of doing that owing to the fact that you cannot recover them unless you reopen them manually. If you reopen them manually then there are chances that you have lost the unsaved data. 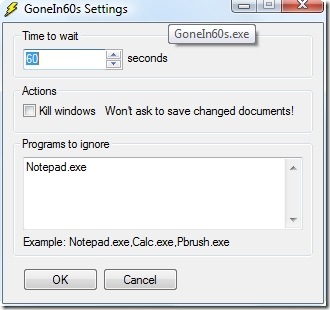 There is a small freeware program called GoneIn60s that can help you out this situation but the name reminds of the Nicolas Cage movie “Gone in 60 seconds”. 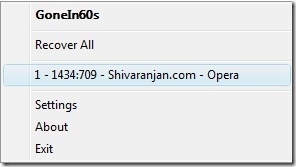 This application does this by not allowing the application that you closed completely by delaying it as per the timeout that is specified by you, the default value is 60 seconds. 1. Download the program GoneIn60s from here. 2. Put the program in a folder and run it. It is recommend that you put this program in folder and run as it creates a *.ini file for storing your settings and by creating a folder you can prevent the accidental deletion of the settings file. 4. That’s it now you need not worry of accidental closure as you can always recover them. You can also change the default timing from 60s to the timeout value of your choice. That means you can convert your GoneIn60s to GoneIn120s. I suggest that you put this program in your Windows startup folder so that it gets started every time you boot into Windows.